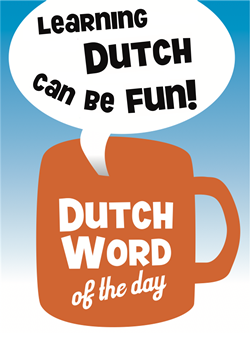 We have almost reached the 100th Dutch word of the day! When Sander first started to explain some of the intricacies of the Dutch language to some of his co-workers, he did not expect the rudimentary explanations of the first DWOTDs to grow into where we are now. After some time Marc joined in writing the DWOTD, since it does take some time! (even for the experienced Dutch like us 🙂 ). Although we are sometimes pressed for time, we try our best to write an informative DWOTD with sentences that you can either use in daily life, or study to improve your Dutch. Readers who wish to discuss the DWOTD can do so on the website, this is also the central repository for all DWOTDs. Don’t forget that you can always request a word by using the mailform (‘Mailformulier’) on the website (or just reply to the mailing). We hope you still enjoy the DWOTD and if you do, please tell others about our website or the mailing list!! This entry was posted in Dutch word of the day, DWOTD 1.0, Vocabulary Basic and tagged bijna by Dutch Gurus. Bookmark the permalink.